Let battle be joined! Embark on your quest of hope, or carve your dark domain in a world of chaos! Whatever your choice, choose quickly. 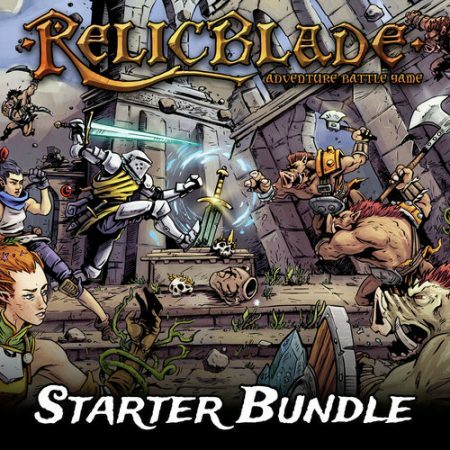 Choose from any available Faction Set and get the Seeker’s Handbook and Relicblade Tokens at a discount! No matter which faction you choose, this starter bundle is the best way to get into the game! Learn more about each faction HERE and discover the content of each faction set in their respective store entries. 1 Faction Set of your choice: each faction set include everything you need to bring that faction to the table, including miniatures, character cards, upgrade cards, and a special scenario. The Seeker’s Handbook: The complete core rules and campaign rules for Relicblade: Adventure Battle Game. Relicblade Tokens: The token set is printed on sturdy 2mm card and die cut with 28 game tokens and 2 handy measurement gauges.